Two male prisoners have escaped from the Alexander Maconochie Centre jail at Hume overnight. 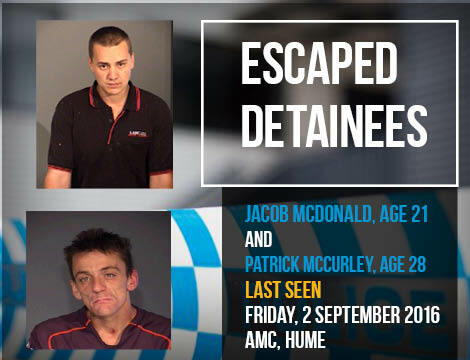 ACT Policing is seeking the public’s assistance to locate 21-year-old Jacob McDonald and 28-year-old Patrick McCurley, who escaped last night. The men were last seen within the AMC about 11.15pm. 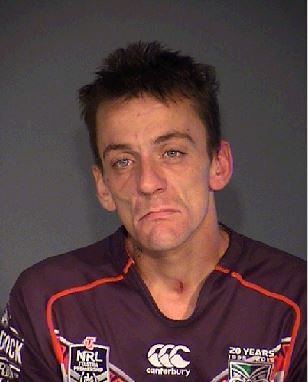 Mr McDonald is in remand for charges relating to property and burglary offences and is described as Caucasian in appearance, solid build, with brown eyes and approximately185cm (6’1”). He was last seen wearing grey pants and a grey jumper. 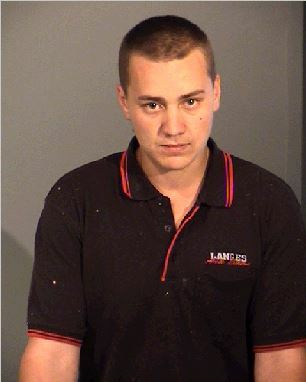 Mr McCurley is in remand for charges relating to motor vehicle offences and is described as Caucasian in appearance, slim build with blue eyes and approximately 180cm (5’11”). He was last seen wearing grey pants and a grey jumper. Police ask the public to call police if they know the whereabouts of either Mr McDonald or Mr McCurley, and do not approach them. Police are urging anyone who may have seen the men, or has information that could assist the search, to contact ACT Policing Operations immediately on 131 444. Police remind readers they should not report crime or information via Facebook and Twitter. This is what happens when you order a rare steak , and it turns up well done. They get steak in that place?